Make Sure Your iPad is CoveredProtect your brand new Apple iPad and defend yourself against scratches with this stunningly designed high-density hard cover. The Animal Print cover itself is made out of weather-resistant TPU Plastic that has been coated over multiple times to make it as dense and protective as we possibly could make it. We wanted to make sure that the iPad was safe and secure once inside the cover and we believe we accomplished just that. Zebra pattern cover is also well designed to be an eye catcher and add some style and personality to your device. * Offers ideal protection for your iPad!!! 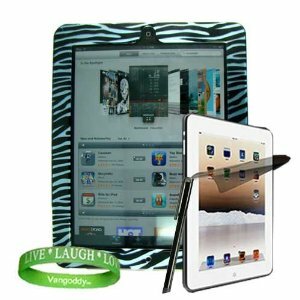 * Zebra design adds Style and Color to your iPad!!! * Sticks out a few 8ths of an inch in the front to protect your screen!!! * Snaps on to your iPad for a secure, perfect fit!!! * iPad is fully functional while equipped with Hard Cover!! !